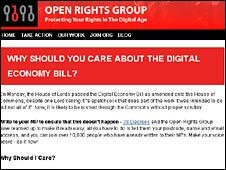 Controversial elements of the Digital Economy Bill will face further scrutiny even if the bill is passed later, Commons Leader Harriet Harman has said. Part of the bill, which refers to how copyright holders can block access to websites hosting pirated content, will be subject to further consultation. Several MPs called for the whole bill to be delayed until after the election. Despite objections, the bill was given a second reading and will be rushed through its final stages on Wednesday. The Tories have said "big questions" have been left unanswered while the Lib Dems are seeking greater scrutiny of some aspects. Closing the debate, Digital Britain Minister Stephen Timms said: "The choice we have is to act on unlawful downloading or not to act. That is the choice the House needs to make. "I think there is actually very broad agreement across the House about the need for us to act in the way that this Bill sets out." Ms Harman revealed to Parliament that one element, known as Clause 18, will be subject to "a super-affirmative procedure" - meaning the details of it will require further Parliamentary scrutiny. Clause 18 was hastily rewritten by the government. It was intended to future-proof the law against new methods of accessing pirated materials. It grants rights-holders the power to force service providers to block access to websites hosting pirated content. The Liberal Democrats have called for a similar procedure to be applied to the issue of how public wi-fi will be affected by the bill. Currently, if the bill passes into law, the owners of publicly-accessed wi-fi will be held responsible for content that is illegally downloaded by individuals using the hotspot. The second reading of the bill was somewhat overshadowed by the earlier announcement of the general election and few MPs gathered in the Commons to hear Culture Secretary Ben Bradshaw introduce it. However, a heated debate followed with several MPs, including Labour MP Tom Watson, calling for the more controversial elements of the bill to be removed. Shadow culture secretary Jeremy Hunt branded the bill a "digital disappointment of colossal proportions". For the Liberal Democrats, culture spokesman Don Foster condemned the government for allowing a "totally inappropriate" amount of time for debate on such a major piece of legislation. He said "large chunks" of the Bill were not controversial and needed to become law. The SNP's Pete Wishart, a former member of Celtic rock group Runrig, told the Commons that internet file-sharing was not unlike a person walking into a record shop and taking whatever albums they liked - for free. He said: "The cream of the UK's creative industries want to ensure that we have this bill and these measures. "Then we can continue to have the best creative industry and digital economy." Earlier Ms Harman said the bill had already been subject to "considerable scrutiny" in the House of Lords, with seven days in committee, "longer than any other bill in this Parliamentary session". But Mr Watson, a long-standing Labour opponent of the bill, urged the government to rethink rushing through the legislation. "In the last seven days, 20,000 people have taken the time to e-mail their MPs. They are extremely upset that it won't have proper scrutiny," he said. Mr Bradshaw countered that "hundreds of thousands of people in the creative industries feel equally strongly that they need the legislation now". He told MPs that a framework for dealing with those who pirated content was essential if alternative legal ways of distributing content were to get off the ground. "It is not ideal that the bill will not enjoy full debate," he acknowledged but said that it had enjoyed "cross-party support". There has been mounting public opposition to the bill, particularly the plans to give Ofcom the power to cut off the internet connections of persistent pirates. Mr Bradshaw moved to reassure MPs that such measures would not be introduced for another year, and said he hoped a letter campaign to persistent net pirates would prove sufficient. If suspensions of net accounts are necessary they will only be "temporary" he added.